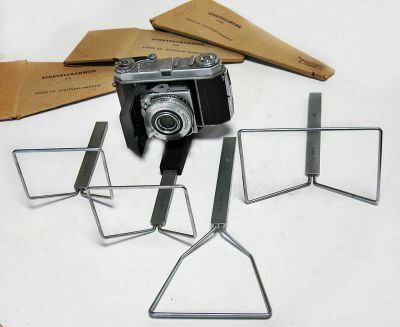 Kodak close-up/copy Attachment, the field frames, and distance gauges, fit in a camera platform, with the Ia,IIa cameras, and the older model Retinas, for placing the older model camera at the correct distance to the subject and framing it. The flat frame is a simple distance gauge, just distance to subject, the Attachment set incl. the camera platform, column of table stand, three frames, a distance gauge, the frames are marked Kodak Stuttgart-Wangen US zone.